What Are The Best Fly Masks For Horses On The Market In 2019? What Are The Best Fly Masks For Horses On The Market? As we all know, the warmer summer months can bring an infestation of flies, which is no fun for you, and even less fun for your horse. You can try to deal with these pests by making sure your muck heap is as far away from the horses as possible, by trying different feed supplements such as garlic to make the biting critters less likely to land and feast on your four legged friend, or you can go down the horse fly spray route. But what if none of these options are available to you or you want something simpler but effective? The muck heap can’t be moved, feed supplements make no difference, and your horse runs a mile at the sight of the spray bottle. If this is the case, fly masks and fly sheets are your new best friend. 2.1 1. Why use a fly mask? 2.2 2. How can a fly mask prevent injuries? 2.3 3. What should you look for in a fly mask? 2.4 4. What good are ear covers? 2.5 5. Why choose an extended or detachable nose piece? 2.6 6. What does fringe do? 2.7 7. Why is stretchy fabric best? 2.8 8. Why do you need fly repellent infused fabric? 2.9 9. Is the infused fly repellent permanent? 2.10 10. Do most horses like wearing a fly mask? 2.11 11. Don’t fly masks bother horses’ eyes? 2.12 12. How can you tell that your horse’s fly mask fits right? 2.13 13. How should the mask fit overall? 2.14 14. Aren’t fly masks expensive? 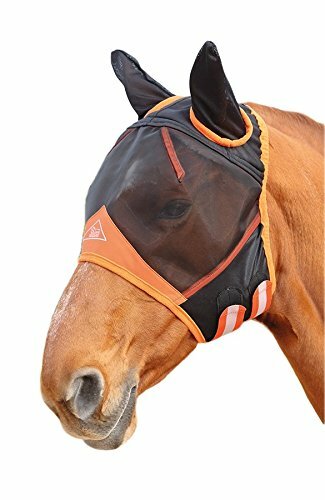 This is a fantastic fly mask, which unlike many others, features a long face covering (no “why the long face?” jokes please!) for maximum fly protection. 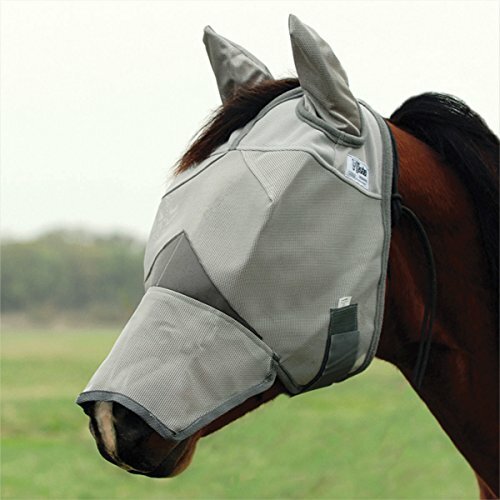 This makes it ideal for horses who really struggle with flies all over their faces, or for places where the flies are particularly persistent. Excellent UV protection – The fine micro-mesh can block up to 70% of the most harmful UV rays, making this mask great for sun protection as well as for flies. Good visibility – The mesh is perfectly able to be seen through; if you look through it yourself it’s just the same as looking through a mesh fly screen over a door. Protects the ears – Because of the attached ear pieces, your horses’ sensitive ears will also be safe from pesky biting flies and other flying insects. Patented three-hole cap – This means the forelock can be removed from the mask, minimising any irritation from hair dropping into their eyes behind the mask. Large sizing – reportedly the sizing runs on the large size, so it may be wise to select a smaller size than you would expect, say a Cob instead of a Full for your bigger horse. The extra length can be a problem whilst grazing – Some users have reported that the end of the mask can ball up a little while the horse grazes, as on some it can be a little too long. If you are looking for a great all round full-face fly protector which can also block the most harmful sun rays, then this is the one for you. It’s ideal for horses with white noses who are prone to burning, as well as anyone who is sensitive to flies and needs a full face covering. Protection and comfort – what more could you and your horse ask for? 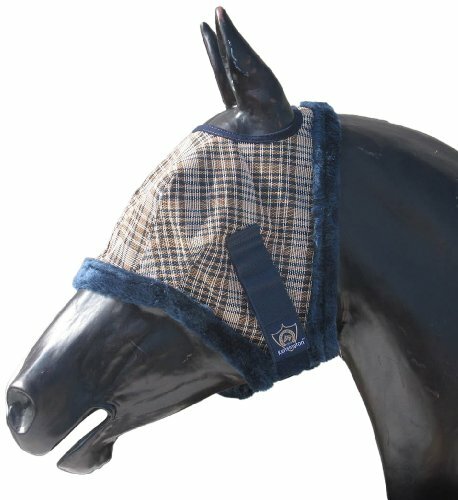 This fly mask is trimmed with fleece to keep it soft against your horse’s face, minimising the potential for painful rubbing. It covers the eye area and is secured with a chin strap, so there is very little danger of it slipping off (or being rubbed off, for those who have naughty horses who like to remove their clothing). It blocks 73% of the most harmful UV rays, meaning your horse can graze in comfort, free from the menace of flies, and you can be safe in the knowledge that they won’t burn. This mask is durable – These masks are well made and designed to withstand wear and tear and daily stresses. Kensington products are rigorously tested and made to stand up to abuse. Designed to stay cool – The mesh is 78% air permeable, and is non-heat-transferring for comfort in hotter climes. Great colors – You can’t talk about the Kensington without mentioning its attractiveness. The Textilene fabric is not only mildew resistant but also maintains it bright colour with no fading. Matchy sets, here we come! Full visibility – The fine mesh is just like looking through a fly screen, so your horse will be able to see perfectly well. Can be hot – While the mesh itself is cool, some horses can get a bit overheated and irritated with the added fleece. If you think this may cause you problems, simply order one without the fleece trim. Sizes run large – Again, these masks can be slightly on the big size, so think about ordering a larger size than you usually would to avoid disappointment. If you are looking for a fly mask that just protects the eyes from irritating insects (and is pretty to look at) then go for the Kensington. It keeps your horse’s eyes free from insects which can cause weeping and irritation, and protects the sensitive skin in that area from damaging UV rays. A good all round fly mask, this one protects the ears as well as the eyes and the upper portion of the face. Ergonomic shaping along the seams minimises gaps that bothersome flies could slip under, making this a fly mask with really good protection. Breathable mesh – Allowing the air to circulate through the mask is essential for comfort, and can help minimise any overheating. Ear protection – Perfect for keeping the more sensitive parts of the body protected, the ear section is attached to the rest of the mask for increased durability, and is made of a soft mesh which allows the ears to move freely. Adjustable Touch-Close straps – The straps can be made to fit smaller or larger heads, and the touch-close system makes it very easy to fasten. The Velcro may not last – Especially in a herd situation if another horse is inclined to pull at straps, you may find the fly mask in the mud the following morning. 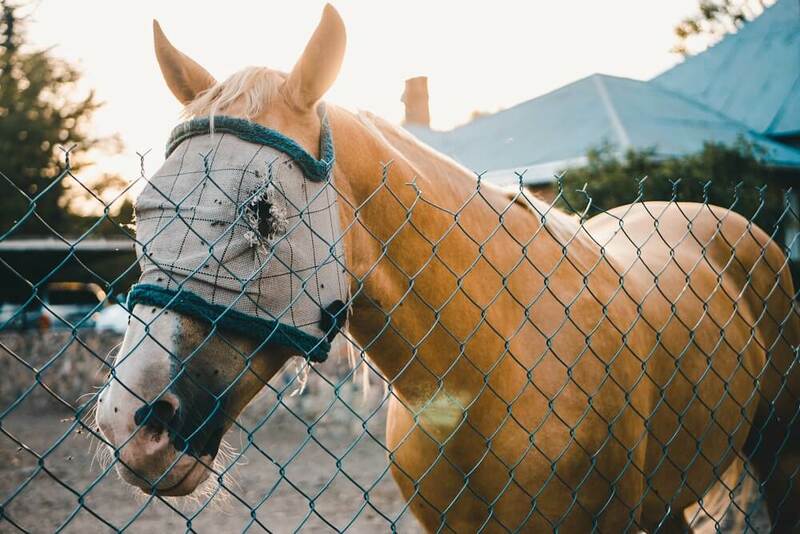 Can get hot – Although the mesh is breathable, some have reported that their horses have got a bit hot and sweaty in this mask. This is a great fly mask for those who need a little more protection than just the eyes, as the ears are also kept safe from biting midges. The mask is sturdy enough that it will maintain its shape and not rub the eyes, and comfortable enough that it can be worn at all times during fly season. 1. Why use a fly mask? Your horse will be more comfortable with a fly mask because it provides a physical barrier that keeps flies away from the face and head. This is very important if your horse is allergic to fly bites. 2. How can a fly mask prevent injuries? When flies bite around a horse’s eyes, ears and nose, it can cause a lot of itching. Horses may resort to scraping their itchy skin against tree bark, fence posts and the like. This can result in abrasions and infection. 3. What should you look for in a fly mask? 4. What good are ear covers? Some fly masks just cover the eye area and leave the ears and nose exposed. If your horse has problems with biting flies that try to get into the ears, ear covers can be very helpful; however, some horses simply will not tolerate wearing ear covers. 5. Why choose an extended or detachable nose piece? The dampness of a horse’s nostrils tends to attract flies. Having a nose piece just gives your horse more protection from flies. It also protects pale skinned horses against sunburn, which is a great added benefit. 6. What does fringe do? Fringe hangs over the horse’s eyes and brushes flies away when your horse shakes his head. 7. Why is stretchy fabric best? Although there are many fly masks made of very rugged, non-stretchy material that is secured with Velcro or other types of fabric, masks made with stretchy Lycra are lighter weight, easier to put on and more form fitting. Horses that don’t like stiff, unyielding fly masks may have no problem wearing a Lycra mask. 8. Why do you need fly repellent infused fabric? The masks that are infused with fly repellent do a better job of keeping flies away from the horse’s face. Other masks may prevent them from being able to access the horse’s ears, eyes and nose, but the flies will still land on the mask and pester the horse. A mask infused with fly repellent will prevent this. 9. Is the infused fly repellent permanent? No, eventually, it wears off/washes out. You can re-infuse it (or simply infuse a plain mask) yourself. When you wash the mask, rinse it in a solution of inexpensive wipe on fly repellent, such as permethrin to get much the same effect. Alternately, spray the mask with fly repellent and allow it to dry thoroughly before putting it on your horse. 10. Do most horses like wearing a fly mask? It really depends on the horse and the level of trust he has with humans/you. If your horse is head-shy, you may have a hard time getting him to wear a fly mask. If he has had some trauma regarding his ears, he may never acquiesce to ear covers. Be patient. If you are eventually able to get the mask on, your horse may well realize that it’s a good thing. If your equine friend is a mule or donkey, he is even more likely to recognize and embrace this welcome improvement in his life. 11. Don’t fly masks bother horses’ eyes? The kind that lie flat over the eye area may very well be bothersome, and having the mesh right over the eye can cause irritation. Look for a mask that has a “canopy style” eye area. These masks are designed in a way that holds the mesh off the horse’s eyes. 12. How can you tell that your horse’s fly mask fits right? Begin by choosing a style that is designed to fit the size of horse that you have. Even then, pay close attention the first time you put the mask on. It should go on easily without struggling. Once it’s in place, you should be able to insert two fingers between the mask and your horse’s throat. Understand that this area will tighten when your horse raises his head, so there needs to be some play around the throat. 13. How should the mask fit overall? Examine the rest of the mask carefully. It should fit in a snug, but not too tight fashion. If it is loose, it may get hung up on something and may pull off or cause injury. If it’s too tight, it can rub sore spots. The bottom edge of the mask should sit a couple of fingers’ width lower than the cheekbone. It should fit comfortably around the horse’s face and jaw. You should be able to slip a couple of fingers under the edge of it. 14. Aren’t fly masks expensive? Even if you have to replace your fly mask a time or two during the fly season, it will still save you money. Not only does a good fly mask keep flies off your horse’s head, it can also help prevent expensive vet bills for serious problems such as sunburn, eye infections and skin rash. A good, well made fly mask which is comfortable and protects the most sensitive parts of the face is a lifesaver, particularly if your horse won’t tolerate any forms of fly spray. For those that need a full face covering and are prone to burning, the Cashel Crusader is perfect. The Kensington fly mask is great for those who want a soft, comfortable fly mask in pretty colors, while the Shires with ears mask is ideal as an all-round great fly mask with added ear protection.